The owners of Silverlake Wine and two Everson Royce wine shops have teamed with chef Matt Molina (ex-Mozza) on the multi-faceted Arts District destination Everson Royce Bar. A fashionable bar with "My That's Better" in cursive neon gives way to a big back patio with picnic tables, a blue bocce court, wood and brick walls, colorful patchwork flooring, strings of lights and views of the sky. 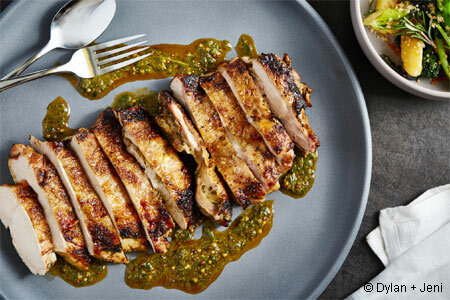 Matt Molina has created a comfort food menu that includes a burger, grilled chicken thighs marinated in Peruvian aji sauce, and biscuits with whipped butter. Co-owner Randy Clement has built an eclectic wine list with minimal mark-up. Bartender Chris Ojeda, previously with Soho House and The Varnish, is overseeing the cocktail program. Dinner nightly. Everson Royce Bar, 1936 E 7th St., Los Angeles, CA 90021, 213-335-6166. Avenue 31, a new sibling of the chic Monaco restaurant of the same name, has opened in the former Le Clafoutis space. Expect a Mediterranean menu and a bar program from mixologist extraordinaire Matthew “Eat Your Drink” Biancaniello, which includes a selection of creative, boozy oysters. Avenue 31, 8630 Sunset Blvd., West Hollywood, CA 90069, 310-360-5983. Chef Tony Xu completes his Chengdu quartet with Chengdu Taste #4 (301 W. Valley Blvd., San Gabriel), slated to open in late autumn 2015, putting a focus on Sichuan noodles. Xu’s three other San Gabriel valley restaurants are popular for spicy Chengdu specialties and other dishes from China’s western region. Fast-casual restaurant concept Yalla Mediterranean is bringing a new location to the Burbank Empire Center on October 20, 2015. The restaurant’s Mediterranean cuisine (spanning Greece, Morocco, Turkey, Lebanon, Israel, Tunisia and Egypt) utilizes locally sourced produce, hormone-free and responsibly raised meats, and wild-caught fish. The menu includes steak skewers with harissa, Turkish spiced ground lamb and beef, wild salmon marinated in Greek yogurt and chermoula, and Moroccan carrot salad. To drink, there will be wine and craft beer, and for dessert you'll find soft-serve Greek yogurt with chopped baklava and honey. Yalla Mediterranean, Burbank Empire Center, 1781 N. Victory Pl., Burbank, CA 91502, 818-565-0426. Restaurateur Stéphane Bombet (Terrine) and chef Michael Hung are behind Viviane, offering continental cuisine, at Avalon Hotel Beverly Hills. Kelly Wearstler designed the space. Bombet Hospitality Group has assumed oversight of all food and beverage operations at the hip property at Olympic Boulevard and Canon Drive, with chef Hung crafting the fare for breakfast, lunch and dinner. Viviane, Avalon Hotel Beverly Hills, 9400 W. Olympic Blvd., Beverly Hills, CA 90212, 310-407-7791. Opening December 1, 2015, is Charcoal Venice, a neighborhood restaurant with fire pit-grilled cuisine from acclaimed chef Josiah Citrin (Mélisse). Dishes will include dry-aged New York steak, grilled chicken and smoked short ribs. House-made vinegars, mustards and sauces will accompany the meats; vegetables include baked Yukon potatoes with chives and Gouda. Charcoal Venice, 425 Washington Blvd., Venice, CA 90292, 310-751-6794. Jesse Gomez and chef/partner Jose Acevedo are heading to Brentwood to open a sister location of popular Studio City Mexican seafood restaurant Maradentro. Maradentro Brentwood will debut in the former Café Rockenwagner (1168 S. Barrington Ave.). Designer Ana Henton will extend the flagship’s modern nautical aesthetic to both the dining room and the patio. Expect similar menu favorites, and an early 2016 opening date. Maradentro Brentwood, 1168 S. Barrington Ave., Brentwood, CA 90049, no phone. Chef Steve Samson (Sotto) will bring a new Italian restaurant, RossoBlù, to the Fashion District’s City Market South redevelopment project, due to open in 2016. Menus will focus on the regions of Bologna and Emilia-Romagna, with handmade pastas, pizza from wood-burning ovens and spit-roasted meats. RossoBlù, City Market South, 1057 S. San Pedro St., Los Angeles, CA 90015, no phone. 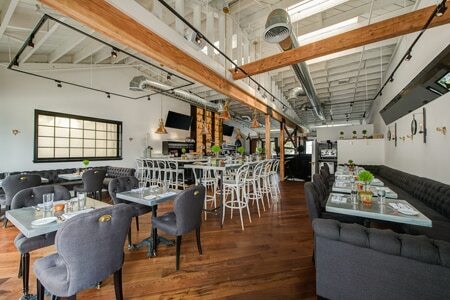 Celebrated San Francisco chef Charles Phan will open an L.A. outpost of his modern Vietnamese restaurant The Slanted Door in downtown’s new City Market South development, located in the Fashion District. The large restaurant will be designed by Olle Lundberg, with a Summer 2016 opening. The Slanted Door, City Market South, 1057 S. San Pedro St., Los Angeles, CA 90015, no phone. Starry Kitchen’s Nguyen and Thi Tran are pairing up with co-owners Jordan Weiss and Gabriel Fowlkes to open Button Mash in Echo Park. Besides offering a motherlode of vintage arcade games, pinball machines and craft beers, the Tran’s menu will feature SK favorites including crispy tofu balls, garlic noodles and tamarind-chile chicken wings. Also, expect new items such as a Coca-Cola-braised jackfruit sandwich with mozzarella on a roll, and vegan specialties. The spot will be open for lunch and dinner, late on weekends, with Saturday and Sunday brunch to follow soon. Button Mash, 1391 Sunset Blvd., Los Angeles, CA 90026, 213-250-9903. Andre Guerrero (Maximiliano, The Oinkster) plans to open a bakery/salumeria/market in Highland Park (5930 York Blvd.) called Sugar & Bone. Expect house-smoked meats, pastas, pastries and breads from pastry chef Jan Purdy, and Intelligentsia coffee. Sugar & Bone, 5930 York Blvd. , Highland Park, CA 90042, no phone. Restaurateur Bill Chait and chef Walter Manzke have opened a second location of Petty Cash Taqueria in downtown L.A.'s Arts District. Petty Cash Taqueria, 712 S. Santa Fe Ave., Los Angeles, CA 90021, 213-624-0210. Susan Feniger’s Mud Hen Tavern has launched its “take-out window extreme” called Blue Window, a concept that runs weekdays only from noon-10 p.m., and rotates themes every six months. The debut theme (through February 2016) is Asia. All dishes are $7 each, and include Korean potstickers, albacore poke, barbecued bao, stuffed tempura, chicken wings and a banh mi sandwich. Dishes can be made vegan upon request. Blue Window, 742 N. Highland Ave., Los Angeles, CA 90038, 323-203-0500. Jon & Vinny's, the Fairfax Avenue restaurant for pizza, pasta and more from Jon Shook and Vinny Dotolo, is currently closed due to a fire. Jon & Vinny's, 412 N. Fairfax Ave., Los Angeles, CA 90036, 323-334-3369. Tar & Roses is closed for construction repairs after a fire in the hood of the wood-burning oven. Tar & Roses, 602 Santa Monica Blvd., Santa Monica, CA 90401, 310-587-0700. Three years after purchasing Pascal Rigo's La Boulange Bakery brand for $100 million, Starbucks has shuttered the La Boulange café in Los Angeles, as well as the locations in San Francisco. La Boulange, 359 S. La Brea Ave., Los Angeles, CA 90036, no phone. Culver City’s highly regarded Italian restaurant in the Helms Bakery complex, Bucato, has closed. Bucato, Helms Bakery, 3280 Helms Ave., Culver City, CA 90034, no phone.